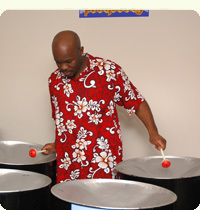 A: Panquility is a steel band ensemble based in the Washington D.C. Metropolitan area. As the name suggests, we produce a vibrant tranquil sound, but be careful we can "bring de bacchanal" when needed. Q: What is the music selection? A: Panquility prides itself on music representative from numerous musical genres. Genres include soca, calypso, reggae, latin, jazz, pop rock, rhythm and blues. Whether recent or classic tunes, all are translated into a Caribbean sensibility to work on steel pan. Q: Do you take special music requests? A: Yes. Panquility will incorporate a favorite song once there is adequate notice. A minimum of 60 days prior notice is required to translate and arrange the music for the steel pan orchestration. Q: How do I get Panquility to perform for my event? A: E-mail info[at]panquility.com or complete the contact form on our "Contact Us" webpage. Q: Do you need access to electricity? A: No. There is no need for electricity. Panquility offers a great natural acoustic blend of all the steel pan family of instruments. A: We require a minimum 10 foot by 10 foot flat area. Q: Do you need any special accommodations? A: Yes. We require a covered area such that the instruments are protected from direct sunlight and inclement weather. We also require a flat surface for the instruments to rest on while being played. Q: How much setup time is required? A: Panquility needs at least 45 minutes setup time. Q: Is there a minimum performance time required? A: Panquility will perform for at least 30 minutes. Q: What is the size of the band? A: Panquility can provide a small or large ensemble depending on your needs. Normally our ensembles consist of various types of steel pans, drumset, and percussion (engine room). Q: What type of dress will the band be wearing at my event? A: For formal events, the uniform is a custom Panquility button down shirt and black dress pants. For informal events, the uniform is Panquility custom casual shirts and dark pants/jeans. A: No travel fee if the location is within a 10 mile radius from Washington DC/MD/VA 495 Beltway. This incorporates most of the Washington, DC Metropolitan area. However, a travel fee is applied to all locations outside of this radius, depending on additional distance to be traveled. Q: How do I reserve a date with Panquility?